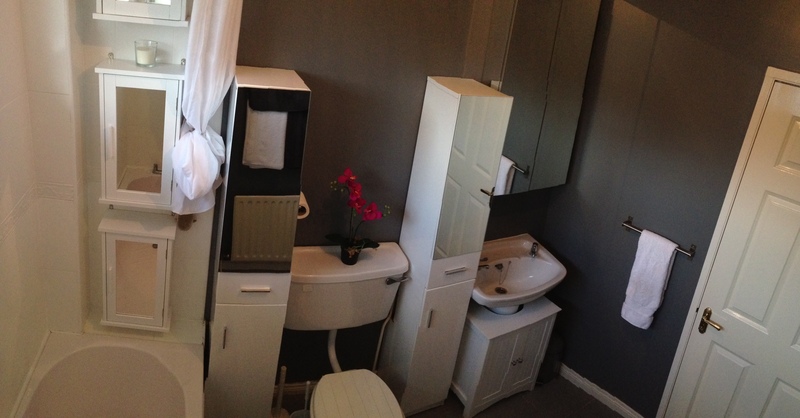 As discussed in Bathroom Project Part One, there is always one room in a second hand house which tells you the previous owners were possibly colour blind and usually it’s the bathroom. Our previously loved home is no different. The bathroom we inherited was decorated in ghastly pink matched with snot green – one word ‘horrific’. Aside from the décor, the room had other issues: there was no storage, the shower was one of these hoses attached to the taps that you have to run around under to get wet, there was very little light, there was a leak at the bath taps and the wind tunnel caused by the draft from the ill-fitting vent was perishing mid-winter. Having resolved the shower, leak and wind tunnel in Part One, the next step in, Part Two, was to change the colours. Now in Part 3, the final stage, it’s time to make this bathroom the throne room it should rightfully be. I started with storage. As you can see in the before pictures, previously storage in this room consisted of a wire rack beneath the sink and a towel rack beside it. This always made the room look messy because everything was on show, and, unlike the perfectly manicured bathrooms in the sales catalogue, in my bathroom the bottles are not all the same size or conveniently the same colour. However, the rack sufficed when we were just two, but now that our family is getting bigger, items that belong in a bathroom that I may have previously stored elsewhere must be returned and in general we will have more things in the bathroom. The requirements for the storage was simple – I wanted enclosed units and as many of them as I could fit, without placing them unreasonably high. I also wanted to tackle the lighting issue with these units. Having ruled out under-shelf lighting because I was nervous working with electricity in the bathroom and didn’t want to pay an electrician, I settled on everything being mirrored. This meant that at least what light did come in through the window and from the ceiling light was bounced around the room for full effectiveness. Initially I began my search with my old favourite, the masters of the small living space, Ikea, but I found their pieces either too big or too expensive. A scan of Woodies and B&Q gave the same result, however Argos came to my rescue. I managed to get two tall boy units small enough to fit in the space between the bath-and-toilet and then the toilet-and-sink. 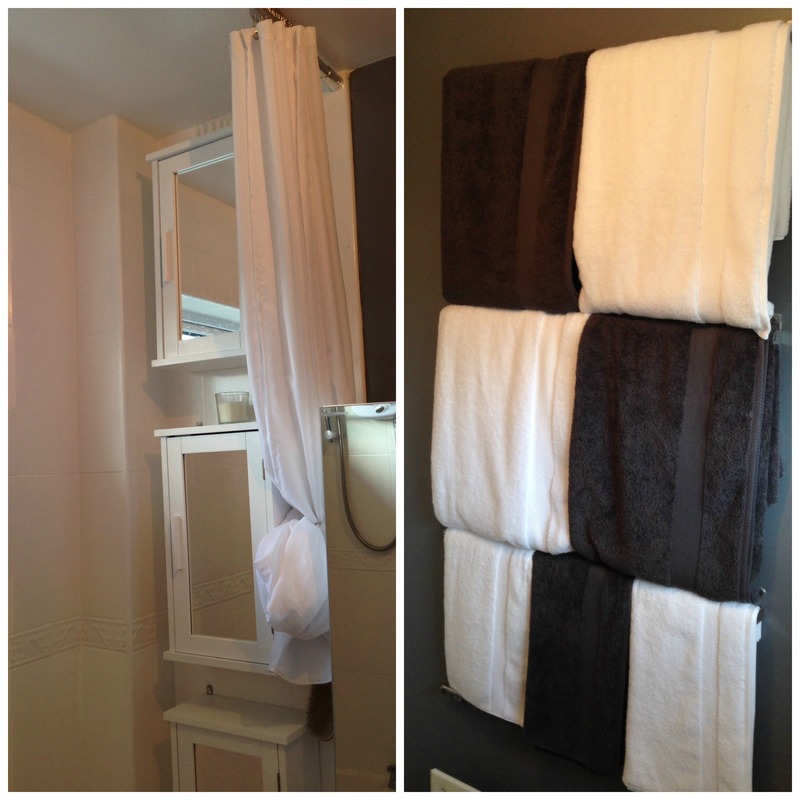 I also purchased three hanging units to hang on the wall at the end of the bath. Although as no trip to Ikea is ever wasted, I did pick up five hanging rails for towels (four for storing clean bath and hand towels , and one for the hand towel currently in use). I also picked up a mirrored unit for over the sink. Next thing I sourced was the shower curtain. Standard shower curtains are 200cm length, and even in Ikea, where everything is designed assuming it will be placed in a high ceilinged Swedish home, the longest was 200cm. I wanted a shower curtain that was at least 220cm length, because I wanted to hang the shower rail at ceiling height, thereby making the room appear taller ( or at least not making the ceiling appear lower because the rail was in eye line). A search of EBay found such the item, and in a very plain white. This meant that when not in use, I could tuck the shower curtain into an old elasticated bracelet and hang it from a hook stuck to the tiles, behind the tall boy. This prevents the curtain screening parts of the room, which makes the room appear smaller. As with most bathrooms, the only soft furnishings are the towels. I was fortunate to be decorating at the time of a 70% sale in House of Frasier and made a killing on some luxury grey and white towels. These I hung in a checker-board fashion. The last piece of decoration to be added was a Banksy poster above the toilet to add a splash of colour, which will be in Part Four.